Welcome to the report on the Winnipeg Condo Market . This report, which is updated monthly with the latest information, focuses on all styles and price ranges of condominiums in Winnipeg, including E.St.Paul and Headingley. Stats are pulled from the MLS®. For our monthly report on houses bet $100K-$500K, see our Winnipeg Housing Market Report. For houses over $500K, see our monthly Winnipeg Luxury Homes Report. Here I present a different way of comparing this months’ sales to the previous month, as well as the previous year. Currently, there are 382 condos, priced bet. $100K and $250 K, available for sale in Winnipeg. This is down about 8% from last month, and a little more than last year this time. Over the past month, Winnipeg REALTORS® have sold 45 condos in this price range, exactly the same as in October, and a little more than in 2017. This statistic is the answer to the question: “If NO MORE LISTINGS come to the market right now, how long would it take to sell all available condos at the current rate?” Here, the lower the number, the hotter the market, and a higher number reflects a stronger ‘Buyers Market’. So, combining the decreased number of available condos with the increase in sales, causes the ‘Days of Inventory’ to drop from 274 to 263, not much movement there. It also becomes a slightly warmer market than the same time last year, when inventory levels were at 285. Over the past month, 138 new condo listings have come to the MLS®, up from the 124 in October, and also up from last year November (120). Thinking of buying an investment condo? Over the past month, 105 listing have either expired or been withdrawn from the market. Condos in all price ranges are still a buyers market, especially when compared to houses in the same range. Currently, there are 275 condos available for sale in Winnipeg in this price range, about 5% fewer than in October, and close to the same number as November 2017. Over the past month, Winnipeg RELATORS® have sold 26 condos in this price range. This is down about 10% from October, and 20% from last year. Currently, Winnipeg’s condo market inventory sits at 328 days in this price range, up significantly from last month, and also up from the 268 days last November. Over the past month, 100 new condos listings have come to the MLS®, down from last month, and up from last year. Over the past month, 68 listing have either expired or been withdrawn from the market, down slightly from last month, and same as last year. Condos in the upper price ranges are in a very strong buyers market. Some upper-end luxury condos have taken over a year to sell, so the options for buyers are great! Currently, there are 487 condos, priced bet. $100K and $250 K, available for sale in Winnipeg. This is down about 7% from last month, but still up 10% over last year the same time. Over the past month, Winnipeg REALTORS® have sold 54 condos in this price range, up from 49 in July, and coincidentally the same number as August 2017. So, combining the decreased number of available condos with the increase in sales, causes the ‘Days of Inventory’ to drop from 330 down to 280. Dont’ break out the champagne, even the lower number of 280 days denotes a fairly slow market, which would take over 9 months to sell everything thats available. Over the past month, 264 new condo listings have come to the MLS®, down from the 179 listed in July, and down from the 175 last year. Over the past month, 125 listing have either expired or been withdrawn from the market, up from the 104 in July 2018, and also up from the 91 last year.. Currently, there are 305 condos available for sale in Winnipeg in this price range, about 5% fewer than in July, and close to the same number as August 2018. Over the past month, Winnipeg RELATORS® have sold 28 condos in this price range. This is down 60% over last month, and 30% over last year. Not the best time to try and sell a high-end condo and special care must be taken when deciding on the list price and marketing strategy. Currently, Winnipeg’s condo market inventory sits at 338 days in this price range, up significantly from last month, and also up from the 246 days last August. Over the past month, 111 new condos listings have come to the MLS®, up from last month, and down from last year. Over the past month, 69 listing have either expired or been withdrawn from the market, up slightly from last month, and last year. This is actually the first Condo Market report of 2018. Here I present a different way of comparing this months’ sales to the previous month, as well as the previous year. Currently, there are 516 condos, priced bet. $100K and $250 K, available for sale in Winnipeg. This is an increase of nearly 80 units from the previous month, and a huge increase over the 393 available in May 2017. (30% year over year). So, combining the increased number of available homes with the slight decrease in sales, causes the ‘Days of Inventory’ to jump from 181 last year to 254 now. Great buyers market. Over the past month, 228 new condo listings have come to the MLS®, down from the 200 listed in April, but up over last years’ 163. Over the past month, 75 listing have either expired or been withdrawn from the market. Currently, there are 334 condos available for sale in Winnipeg in this price range, approx. 13% more than last month (289) and about the same as last year. Over the past month, Winnipeg RELATORS® have sold 39 condos in this price range. This is up slightly over last month, but down about 15% over last year. Currently, Winnipeg’s condo market inventory sits at 257 days in this price range, about the same as last month, but quite a bit slower than last year. Over the past month, 159 new condos listings have come to the MLS®, up from last month, and from last year. Over the past month, 45 listing have either expired or been withdrawn from the market, about the same as last month, and 15% more than last year. This price range forms the bulk of Winnipeg’s condo sales. According to Winnipeg REALTORS®, this accounts for approx. 67% of all condo sales. Over the past month, Winnipeg RELATORS® have sold only 37 condos in this price range, down significantly from the high point in May, put still nearly twice as many in January. Currently, Winnipeg’s condo market inventory sits at 287 days in this price range, relatively high when compared to some of the housing segments, such as 70 days for houses in this same price range. Condos in nearly all price ranges are firmly in a ‘buyers market’. Over the past month, only 94 new condo listings have come to the MLS®, down from the nearly 200 listed in June. Over the past month, 78 listing have either expired or been withdrawn from the market. Currently, there are 243 condos available for sale in Winnipeg in this price range, approaching the yearly low-point set past January of only 209 Condos. Over the past month, Winnipeg RELATORS® have sold 32 condos in this price range. Currently, Winnipeg’s condo market inventory sits at 228 days in this price range compare to last year’s December of 380 days. Over the past month, only 60 new condos listings have come to the MLS®, making this the low point of this year. Over the past month, 44 listing have either expired or been withdrawn from the market, more than the 35 expired in March, and less than the level of the year-high January. Currently, there are 437 condos available for sale in Winnipeg, up from the 393 in May 2017. Over the past month, Winnipeg RELATORS® have sold 54 condos in this price range, down slightly from the 60 sold in July, however nearly triple the number sold in January (19). Currently, Winnipeg’s condo market inventory sits at 251 days in this price range, relatively high when compared to some of the housing segments, such as 70 days for houses in this same price range. Condos in nearly all price ranges are firmly in a ‘buyers market’. Over the past month, 175 new condos listings have come to the MLS®, down from the nearly 200 listed in June. Over the past month, 91 listing have either expired or been withdrawn from the market, up from 79 in July, but still well below the 110 which expired in October 2016. Currently, there are 310 condos available for sale in Winnipeg in this price range, nearly the same as the 306 available in July, or the 317 in June. Over the past month, Winnipeg RELATORS® have sold 39 condos in this price range, a slight decrease of the 45 sold in the previous month. 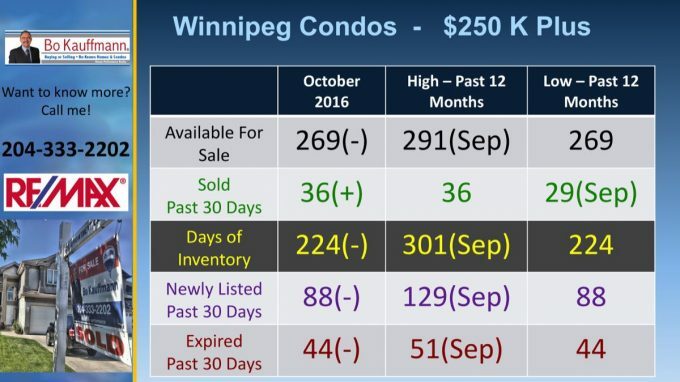 Currently, Winnipeg’s condo market inventory sits at 246 days in this price range. Slower than the 204 in July but far better than then 380 days in December. Over the past month, 139 new condos listings have come to the MLS®, up from the 116 the previous month. Over the past month, 67 listing have either expired or been withdrawn from the market, more than the 35 expired in March, and less than the level of the year-high January. Currently, there are 425 condos available for sale in Winnipeg, up from the 393 in May 2017. Currently, Winnipeg’s condo market inventory sits at 253 days in this price range, relatively high when compared to some of the housing segments, such as 56 days for houses in this same price range. Condos in nearly all price ranges are firmly in a ‘buyers market’. Over the past month, 199 new condos listings have come to the MLS®, making it the high-point of the past year. Over the past month, 86 listing have either expired or been withdrawn from the market, up from 71 in May, but still well below the 110 which expired in October 2016. Currently, there are 317 condos available for sale in Winnipeg in this price range, down from the 330 in May, and up from the 209 in January. Over the past month, Winnipeg RELATORS® have sold 47 condos in this price range, a slight increase of the 45 sold in the previous month. Currently, Winnipeg’s condo market inventory sits at 209 days in this price range. Slower than the 180 in April but far better than then 380 days (over a year?) in December. Over the past month, 120 new condos listings have come to the MLS®, down from the 139 the previous month. Over the past month, 70 listing have either expired or been withdrawn from the market, more than the 38 expired in May, and about the same as the level of the year-high January. Currently, there are 388 condos available for sale in Winnipeg, up from the 360 in March. Currently, Winnipeg’s condo market inventory sits at 227 days in this price range, relatively high when compared to some of the housing segments, such as 61 days for houses in this same price range. It has improved over the stats of March, when inventory sat at 373 days. Over the past month, 178 new condos listings have come to the MLS®, making it the high-point of the past year. Over the past month, 72 listing have either expired or been withdrawn from the market, up from 52 in March, but still well below the 110 which expired in October 2016. Condos in this price range are still a buyers market, especially when compared to houses in the same range. Currently, there are 307 condos available for sale in Winnipeg in this price range, up from the 246 in March, and from the 209 in January. Over the past month, Winnipeg RELATORS® have sold 53 condos in this price range, a slight increase of the 42 sold in the previous month. 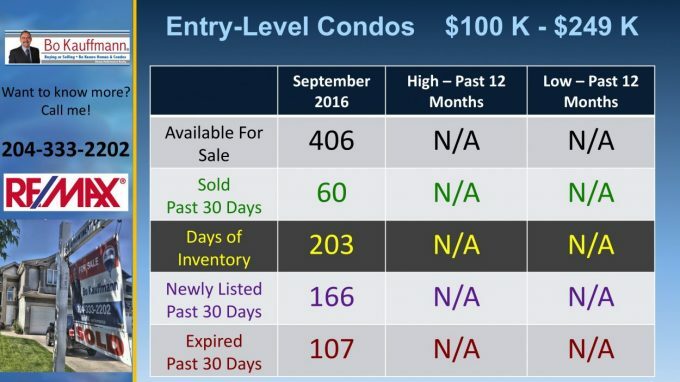 Currently, Winnipeg’s condo market inventory sits at 180 days in this price range. Better (faster) than the 219 days in the February report, but slower than the 164 days in March…..good for buyers. Over the past month, 155 new condos listings have come to the MLS®, up from the 121 the previous month. Currently, there are 360 condos available for sale in Winnipeg, up from the 309 in Feb.
Over the past month, Winnipeg RELATORS® have sold 27 condos in this price range. More than in January, but about half from the yearly highpoint of 60 in September. Currently, Winnipeg’s condo market inventory sits at 373 days in this price range, relatively high when compared to some of the housing segments, such as 57 days for houses in this same price range. Over the past month, 160 new condos listings have come to the MLS®, nearly the same as the highpoint last Sept..
Over the past month, 52 listing have either expired or been withdrawn from the market, down from the 67 in Feb, and from the 92 in January. Currently, there are 246 condos available for sale in Winnipeg in this price range, up from the 240 in Feb.., and from the 209 in January. Over the past month, Winnipeg RELATORS® have sold 42 condos in this price range, a slight increase of the 34 sold in the previous month. Currently, Winnipeg’s condo market inventory sits at 164 days in this price range. Better (faster) than the 219 days in the February report, but this is still a relatively slow market…..good for buyers. 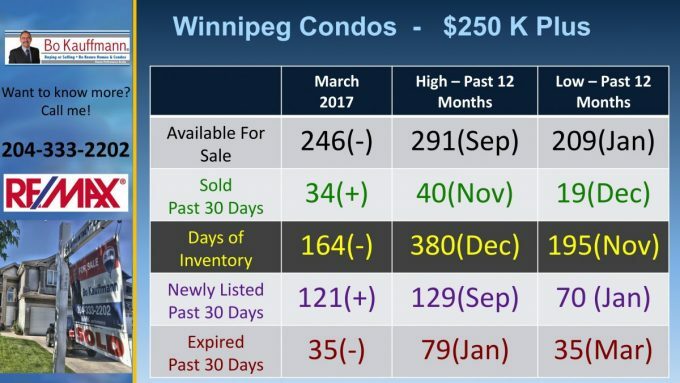 Currently, there are 278 condos available for sale in Winnipeg, down from the 313 in the previous Winnipeg Condo Market report, actually making this the lowest level in the past year. Over the past month, Winnipeg RELATORS® have sold 19 condos in this price range, less than half (40) of the number sold in December 2016. Currently, Winnipeg’s condo market inventory sits at 454 days in this price range, nealy double that of the 234 days in the previous report. Over the past month, 83 new condos listings have come to the MLS®, down from the 103 in the previous month, again making this the lowest number in the past 12 months. Over the past month, 92 listing have either expired or been withdrawn from the market, up from the 82 expired listings in the previous month. Currently, there are 209 condos available for sale in Winnipeg in this price range, down from the 241 in December, and again the lowest available number in the past year. Over the past month, Winnipeg RELATORS® have sold just 23 condos in this price range, a slight increase of the 19 sold in the previous month. Currently, Winnipeg’s condo market inventory sits at 282 days in this price range. Better (faster) than the 380 days in Decembers report, but this is still a relatively slow market…..good for buyers. Over the past month, only 70 new condos listings have come to the MLS®, nearly the same as the month before. Over the past month, 79 listing have either expired or been withdrawn from the market, up from the 51 in Decembers Winnipeg Condo Market report. Currently, there are 313 condos available for sale in Winnipeg, down from the 335 in the previous Winnipeg Condo Market report. Over the past month, Winnipeg RELATORS® have sold 40 condos in this price range, up slightly from the 38 sold in November. Currently, Winnipeg’s condo market inventory sits at 234 days in this price range, a little faster market than the 273 days in last month’s report. Over the past month, 103 new condos listings have come to the MLS®, down from the 118 in the previous month. Over the past month, 82 listing have either expired or been withdrawn from the market, up from the 69 expired listings in the previous month. Currently, there are 241 condos available for sale in Winnipeg, 10 fewer than the 251 in November. Over the past month, Winnipeg RELATORS® have sold just 19 condos in this price range, a significant decrease from the 40 sold in the previous month. 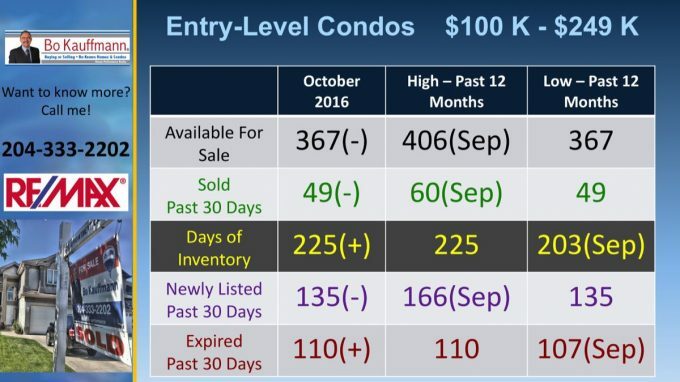 Currently, Winnipeg’s condo market inventory catapulted to 380 days in this price range. Still large inventory and slower sales means a slightly cooler market, when compared to the 195 days of inventory in the previous period. Over the past month, 51 listing have either expired or been withdrawn from the market, down from the 72 in Novembers Winnipeg Condo Market report. Over the past month, only 71 new condos listings have come to the MLS®. Currently, there are 335 condos available for sale in Winnipeg, down from the 367 in the previous Winnipeg Condo Market report. Over the past month, Winnipeg RELATORS® have sold 38 condos in this price range, also down from the 49 sold in October. Currently, Winnipeg’s condo market inventory sits at 273 days in this price range, quite a bit slower than the 225 days in last month’s report. Over the past month, 118 new condos listings have come to the MLS®, down from the 135 in the previous month. Over the past month, 69 listing have either expired or been withdrawn from the market, down from the 110 expired listings in the previous month. Currently, there are 251 condos available for sale in Winnipeg, down from the 269 in October. Over the past month, Winnipeg RELATORS® have sold 40 condos in this price range, an increase over the 36 sold in the previous month. Currently, Winnipeg’s condo market inventory sits at 195 days in this price range. Lower inventory and higher sales means a slightly warmer market, when compared to the 224 days of inventory in the previous period. Over the past month, 72 listing have either expired or been withdrawn from the market, up from the 44 in Octobers Winnipeg Condo Market report. Over the past month, 102 new condos listings have come to the MLS®, also up from the 102 in October 2016. Currently, there are 367 condos available for sale in Winnipeg, down from the 406 in the previous Winnipeg Condo Market report. Over the past month, Winnipeg RELATORS® have sold 49 condos in this price range, also down from the report in September. Currently, Winnipeg’s condo market inventory sits at 225 days in this price range, a slower market than the 203 days in last month’s report. Over the past month, 135 new condos listings have come to the MLS®, down from the 166 in the previous month. Over the past month, 110 listing have either expired or been withdrawn from the market, up slightly from the 107 expired listings in the previous month. Currently, there are 269 condos available for sale in Winnipeg, down from the 291 in September. Over the past month, Winnipeg RELATORS® have sold 36 condos in this price range, an increase over the 29 sold in the previous month. Currently, Winnipeg’s condo market inventory sits at 224 days in this price range. Lower inventory and higher sales means a slightly warmer market, when compared to the 301 days of inventory in the previous period. Over the past month, 44 listing have either expired or been withdrawn from the market, down from the 51 in Septembers Winnipeg Condo Market report. Over the past month, 88 new condos listings have come to the MLS®, also down from the 129 in September. Currently, there are 406 condos available for sale in Winnipeg. Over the past month, Winnipeg RELATORS® have sold 60 condos in this price range. Currently, Winnipeg’s condo market inventory sits at 203 days in this price range. Over the past month, 166 new condos listings have come to the MLS®. Over the past month, 107 listing have either expired or been withdrawn from the market. Currently, there are 291 condos available for sale in Winnipeg. Over the past month, Winnipeg RELATORS® have sold 29 condos in this price range. Currently, Winnipeg’s condo market inventory sits at 301 days in this price range. Over the past month, 51 listing have either expired or been withdrawn from the market. Over the past month, 129 new luxury condos listings have come to the MLS®. This is a very comprehensive report! I hope home buyers in Winnipeg can read this to educate themselves on the condominium market. Wow this is full of details. Thank you for giving the effort of creating this article. This site is very helpful. It is very detailed. A lot of help for people who wants to purchase a home. The Winnipeg condominium market seems to be doing good last month. I am pretty sure the numbers will be even better this month. Great, it’s good to be in the know how of Winnipeg’s condominium sales. I wonder how those numbers fluctuate during the year. These units looks amazing. However I am in manila right now, So I do not know what to say. What is shocking though is there is actually a guide to these? Where is winnipeg actually? California? and judging from these numbers even houses are treated like shares of stock or something. Lol that was an hilarious video. I almost ready to buy and this gives me an great overall view on what I need to consider. I know when I do get ready to buy my budget will be 100k or less. Sales have gone up in the past month. That a positive thing to hear and indicates that the economy is on the rise and people are feeling more confident to buy. Wow that is a nice intro pic of Winnipeg. Makes me want to buy a condo there. I think it would be a great investment indeed. Will be contacting you this week to discuss further details.